Our hearts go out to those impacted by heavy rains and flooding due to Hurricane Irma. We know what a difficult time this is and we want to do everything we can to help. Q: I’ve had to evacuate. Is there any way I can access my XFINITY services? Click here for a map of XFINITY WiFi hotspots, which are located both indoors and outdoors. Once at a hotspot, select “xfinitywifi” from the list of available networks, and then launch a browser. Non-XFINITY Internet subscribers should visit the “Not an XFINITY Internet Customer” section of the sign-in page to get started. Non-customers will be able to renew their complimentary sessions every two hours through Wednesday, September 20. XFINITY TV customers can watch live TV and XFINITY On Demand on any device in home and while on the go. If you’re an X1 DVR customer, you can also stream or download your DVR recordings to your device and watch anywhere. The easy way to check for service outages, troubleshoot or refresh your equipment, and manage your XFINITY account anywhere, anytime. Comcast Business customers can visit comcast.com/myaccount or use the Comcast Business app. Contains WiFi security features to improve your safety and privacy while using certain XFINITY WiFi hotspots. The app automatically connects you to XFINITY WiFi hotspots when in range. XFINITY Voice Unlimited customers can stay connected on the go with the XFINITY Connect app. Check your Comcast.net email, send and receive text messages, make and receive voice calls and check your XFINITY voicemail all in one place. Answer your home phone calls and forward calls from your home phone to your smartphone. 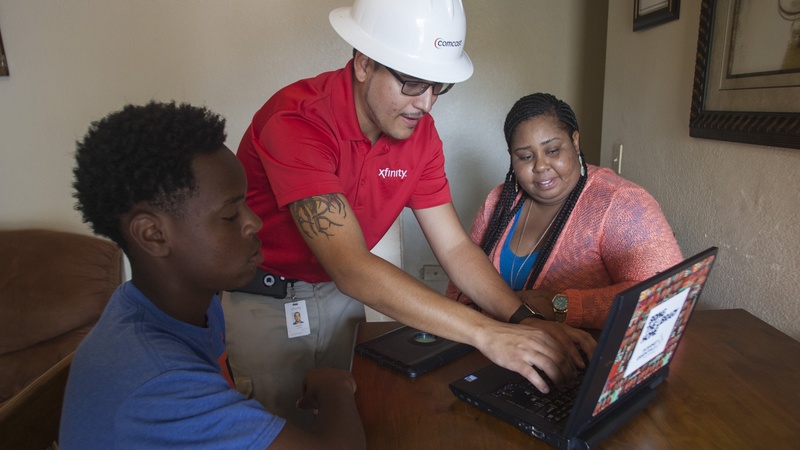 XFINITY Home customers can stay connected anytime, anywhere. Remotely arm and disarm your system. Set rules to get real-time text and email alerts when alarms are triggered and motion is detected. Customers with cameras installed have access to remote video monitoring. Q: What should I do if my XFINITY service is down? If you are experiencing a loss of XFINITY services due to severe weather conditions, please be aware that this could be the result of a local power outage and/or damage to our network that serves your neighborhood. We will work as quickly and safely as possible to restore your service, but please be aware that we typically must wait for local power companies to first restore power to your neighborhood and for local authorities to allow our teams into the area to repair our network. It is possible that power could be restored to your home but the XFINITY network serving your neighborhood is still affected, preventing XFINITY services from working. Also, power must be restored at your home before XFINITY services can work properly. Comcast Business customers can visit business.comcast.com/myaccount or use the Comcast Business app. Q: My XFINITY service is out. Can you please give me an estimate of when my service will be restored? A: The most effective way for you to get outage updates for your area and information about your XFINITY service is to visit My Account, use the XFINITY My Account app, or check out the Status Center. A: If you are experiencing a loss of XFINITY services due to severe weather conditions, please be aware that this could be the result of a local power outage and/or damage to our network that serves your neighborhood. We will work as quickly and safely as possible to restore your service, but please be aware that we typically must wait for local power companies to first restore power to your neighborhood and for local authorities to allow our teams into the area to repair our network. It is possible that local power could be restored to your home but the XFINITY network serving your neighborhood is still affected, preventing XFINITY services from working. Q: I have power, but my XFINITY services are out. Why don’t I have XFINITY services? A: If you are experiencing a loss of XFINITY services due to severe weather conditions, please be aware that this could be the result of a local power outage and/or damage to our network that serves your neighborhood. We will work as quickly and safely as possible to restore your service, but please be aware that we typically must wait for local power companies to first restore power to your neighborhood and for local authorities to allow our teams into the area to repair our network. It is possible that power could be restored to your home but the XFINITY network serving your neighborhood is still affected, preventing XFINITY services from working. Please be assured that we are working to restore service as quickly and safely as possible. Get outage updates for your area and information about your XFINITY service by visiting My Account, using the XFINITY My Account app, or checking the Status Center. Q: The power has been restored in my home. How can I get my XFINITY services back up and running? A: You can try unplugging your XFINITY equipment from its power source, waiting 5 seconds, and plugging your equipment back into the power source. Or, you can also use XFINITY My Account or the My Account app to reboot your equipment. A: Temporary fluctuations in your TV service may occur throughout the restoration period. You may experience brief losses of your TV services or degradation of picture quality while we are working to restore XFINITY services. Q: My neighbor has TV, Internet and Voice services but I do not. A: Even though your neighbor may have service, it’s possible that your home receives its XFINITY connection from another part of our network that has been affected by the severe weather. Crews will restore services as quickly as possible. Check My Account, the XFINITY My Account app, or the Status Center to see if an outage has been reported for your address. If your services are out, but it’s not reported, please notify us of your outage within My Account or by calling 1-800-XFINITY (1-800-934-6489).